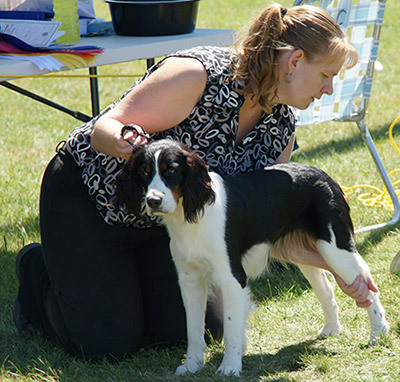 Cori Fielding specializes in training quality family dogs in the English Springer Spaniel line. Fielding Line is currently breeding her Championship dog, a liver and white male named Grommet, and her black and white tri-colour female, Onyx, who is just a 2 point major away from her championship. Cori's focus is high quality and works with her puppies each day to make sure they are ready for a family. Both parents are gentle and calm mannered, and Grommet loves agility and hunting. All puppies are registered, microchipped, dewormed, and come with tails docked and dew claws removed. Please contact us or visit our website to see what is available. 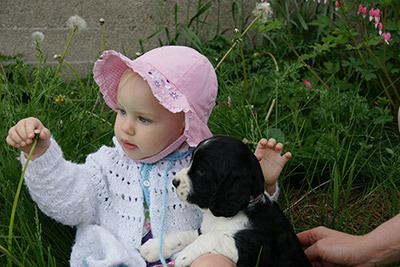 We are not a high quantity breeder and will not have puppies available at all times in the year. Our focus is on quality, and that takes time, but it is time well spent.